Milestones are often daunting and deserve recognition. But, at the same time, they are also just days in the year, and life keeps on going. I celebrated my 50th birthday over the holidays, and leading up to it, I had a long list of things I wanted to change by the time I was 50. But, the day came and went, and I was still the same person doing mostly the same things. This is also the way New Year’s is. It is a day that comes and goes with a list of resolutions, but the real change comes from digging in and doing the work each day to be your best self. The day doesn’t change you, but the work you do before and after makes the change. To commemorate this auspicious occasion, my family took a trip to Belize. While there, one of the most small, yet amazing animals I saw in vast numbers were leaf-cutter ants. Every night, I would look with my flashlight along rails and fences, and I would see armies of moving leaves and flowers atop ants walking in an uninterrupted line. It was almost as if plants were moving on every surface. Looking closely, each ant was staggering under the size of a piece of plant that was many times its size. Leaf-cutter ants are one of the hardest-working species that exists. They are endemic to South and Central America, but some species do extend as far as Colorado. Next to humans, leaf-cutter ants form the largest and most complex animal societies on Earth. Other than humans, they are the only species that actually grow and cultivate their own food source. They live in large colonies underground and can be seen trekking back home with pieces of plant often three times their size and 5,000 times their body weight. The individual ant chews a portion of a leaf or flower and races back to the colony to deliver its offering. The leaf will be chewed into a pulpy mass that makes a perfect breeding ground for a particular fungus that ants eat. The fresh vegetation is necessary to sustain their fungal diet, and they maintain it to keep it free of pests and mold. In addition to working on the fungal garden, other ants are responsible for transporting waste and dead ants to an outside waste heap. The work of a leaf-cutter ant is continuous and grueling but ensures the survival of the whole colony. So, as a reminder to all of us in the new year. Jan. 1 is just a day. The work begins in small steps that continue on. 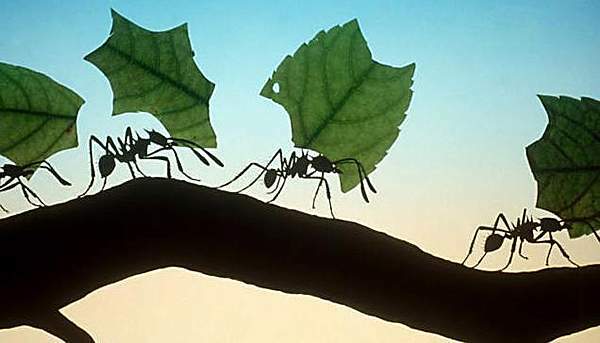 Like the example of the leaf-cutter ant, it requires hard work and singularity of focus.